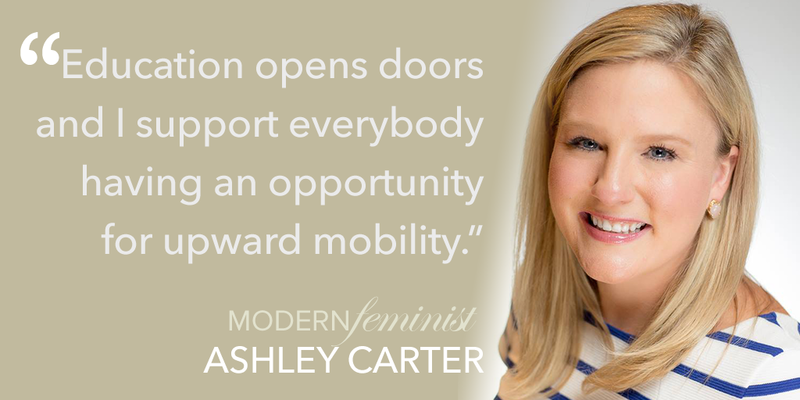 As part of her job as coalitions director for Independent Women's Forum, Ashley Carter, now the newly-elected at-large member of the District of Columbia State Board of Education, often found herself urging women to make a difference by running for political office. Finally, somebody confronted Carter. "You're telling us to run," a member of an audience where Carter was speaking said, "but have you ever run for office?" Well, no, Carter admitted, she had never thought about running for office, but she hastily added, "Don't let that stop you." Ever the encourager, Carter even added that her interlocutor didn't have to run for Congress. Local offices such as a school board could make a difference, too, Carter helpfully explained--even if Carter herself had no intention of pursuing one of these offices. But an idea was planted. That night Carter, 33, joined neighbors for dinner. Although there was a public elementary school right across the street, Carter's friends confessed that they would eventually flee the District to seek better public schools for their children in Virginia or Maryland. Ashley Carter realized she had to take her own advice. A political campaign was born. "Why are we losing good citizens and good taxpayers and giving them away to Maryland or Virginia because of the school system?" Carter wondered. "I also live in the District and, when I have kids, I want to raise them here," adds Carter, who is in a long-term relationship. Carter launched a campaign for the at-large seat on the D.C. State Board of Education that had an outcome which surprised the D.C. political establishment. "Carter's victory in a high-turnout election over the more experienced and heavily endorsed incumbent Mary Lord was utterly unexpected," the Washington City Paper noted in a front-page profile of Carter, who is seen on the cover in an Oxford shirt and blazer. In a field of three candidates, Ashley took 32.44 percent of the votes, compared to Lord's 28.78 percent and Tony Donaldson Jr.'s 16.19 percent. There was something else stunning about the win: It made Carter the highest ranking elected Republican in a city-wide elected office. In fact, it makes Carter the only elected Republican currently in office in DC. While the office is nonpartisan, Lord tried to make Carter's membership in the Republican Party a handicap. Lord touted Carter's party affiliation especially in Wards 7 and 8. "I did not deny it," Carter told the City Paper. "I stuck to an education platform. I made sure people felt as if their voice would be heard, which is something my opponent did not do. She was not visible in their part of the city." Carter found enthusiastic volunteers. "Some of my friends would sit in my living room making calls and stuffing envelopes until 2 a.m.," she recalls. "It came down to making sure we were putting in the effort." A big part of that effort was a punishing speaking schedule. "A lot of my campaign was speaking to voters all over the city," Carter says. "I made a concentrated effort to speak to constituents east of the Anacostia River who felt that they had been ignored." Carter tells IWF, over a noisy lunch at Vapiano near Dupont Circle, that the number one factor in a child's success at school is family involvement. "We need to engage parents or guardians and make sure they have the resources to be involved in their children's education," she says. She is particularly impressed with how Jefferson Academy, a school in Southwest Washington, achieved more family involvement. Parental participation had been lower than was wanted and school officials felt that this was reflected in student achievement. Officials began asking why parents weren't more active at school. It seems that there were no laundry facilities for miles around. Parents were involved with their kids, but this involvement took the form of making sure they had clean clothes for school, which required going to distant parts of town or even another state, often carrying laundry on the bus. Jefferson Academy in conjunction with the Edgewood/Brookland Family Support Collaborative, added washers and dryers on the premises--parents now have the option to come to school to wash their laundry--and meet with teachers at the same time. This is credited with improving student success at Jefferson. "It's not that family members don't want to be engaged with their children’s school," Ashley says, "but often there is an underlying problem that prevents them from doing so." Overall, however, Carter worries about DC’s graduation rates which is currently the lowest in the country. "Our graduation rate is 69 percent," she says. "That’s not acceptable. If you make 69 on a test, that’s not good enough." Carter's platform for public education in the District has three planks: raising the graduation rate, adding more career and technical courses, including courses on computers and engineering, and adding more student support to classrooms. She would like to see the addition of more trained volunteers who can help overworked teachers with student reading levels. "I believe in public education and that everybody has a right to an education," she says. "Education opens doors and I support everybody having an opportunity for upward mobility." Carter's devotion to public education is easy to explain--she is the product of public schools, from elementary school to law school. Carter grew up on Maryland's historic Kent Island, the largest island in the Chesapeake Bay, a picturesque place that was settled by the English in the 1600s. Neither of her parents had a college degree, but they founded a successful construction company on the island. There was also a foreshadowing of Ashley's future political career during her early years: Carter represented George W. Bush in her high school's mock presidential campaign. She was a minority on campus (as she would later come to understand, as one of the ten College Republicans at the University of Maryland), but when Bush won, Ashley got to deliver a victory speech. Ashley's political interests had already been awakened years before high school, however. An early memory was watching President Ronald Reagan on TV. "I remember him saying 'Mr. Gorbachev, tear down that wall.' I remember this distinctly. It seems I was always attracted to politics." Ashley went on to the University of Maryland, College Park, where she received a B.A. in government and politics. During college, Ashley interned for a Maryland Congressman and spent her first year after graduation working for a Maryland State Delegate from Baltimore. While working full time, she went to school at night at the Columbus Law School of the Catholic University of America, her only stint at a non-public educational institution, and ultimately received her law degree from the University of Baltimore School of Law. After law school, Ashley worked at a law firm. "It wasn't driving me," she recalls. "Looking over legal documents and pleadings didn't excite me. I had an epiphany. I said, 'I truly love politics. Why can't I do law and politics?'" Carter went to work for the Republican National Lawyers Association, where she got her feet wet working on political campaigns at the national, state and local levels and making sure elections were open, fair, and honest. In addition to being active in politics, Ashley belongs to the Junior League of Washington and works with several nonprofit organizations to promote literacy. She is a Nationals fan and has a personality-laden cat named Destroyer. When she came to IWF and IWV, a lawyer who had worked with Ashley told the powers that be, "This is who you want to hire." She works hard during the day and in the evenings visits constituents. As is generally the case for the Modern Feminist, we ask Carter: Do you consider yourself a feminist? "Yes, I do," she replies. "A feminist is a woman who chooses the life she wants to lead and leads it by example. She may be a CEO of a big corporation or a stay-at-home-mother. I support all these choices that women make, and therefore I consider myself a feminist." And the last question: Will other political offices, perhaps Congress or the Senate, be in your future? "Let's just start with day one of the board of education," she says. But I can plant the idea, can't I? Who knows, maybe she will meet neighbors who have a problem only a Senator Carter can solve?